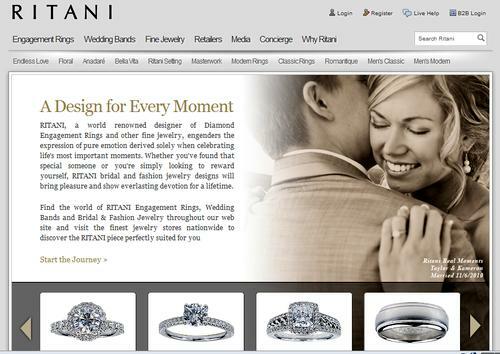 RITANI specializes in diamond rings, especially engagement rings. These diamond designs are meant to reflect sincere emotion and mark the most important things in life. Designer engagement rings by RITANI are exquisite designs in diamond and precious metals that will last a lifetime and beyond. Brides and appreciators of fine jewelry everywhere love RITANI. The official website of RITANI makes the purchase of these pieces much easier. But the rings are also available in fine jewelry stores nationwide. RITANI is dedicated to helping you find the perfect ring for your special someone. RITANI has been in business since 1999 and pays close attention to creating rings that are detailed and perfectly finished. The designs and craftsmanship set apart these pieces. Women seek after designer engagement rings by RITANI for their uniqueness and style. These rings can be worn everyday but adapt well to any special occasion, day or night. Inspiration for the designs comes from the desire to capture special moments in a ring. Nature, romance, and special times inspire the designer to create elegant rings. Rings may be custom designed or selected from one of the collections including Romantique, Endless Love, or Ritani Setting. The designs are hand crafted in a New York factory where computer generated design is transformed into art in precious metal and diamonds. Though high technology is employed to design the pieces, old time craftsmanship is used in the setting and finishing of designer engagement rings by RITANI. All the rings in the RITANI collections are set with diamonds and gemstones that are hand selected by certified gemologists. Precious metals used include platinum and 18k white or yellow gold. RITANI prides itself on its beautiful finishes. Each ring is finished perfectly before it is approved for sale. The designer engagement rings by RITANI include collections that show the eclectic tastes of the designer. Both modern and classic designs are included. There is something for every taste and style at RITANI. Some of the notable collections are made distinct by special design elements. The Floral collection features large center diamonds surrounded by four petal shaped pave supports. The Anadare collection has delicately designed shanks with twisted and intertwined profiles that represent the intertwining of loving hearts. 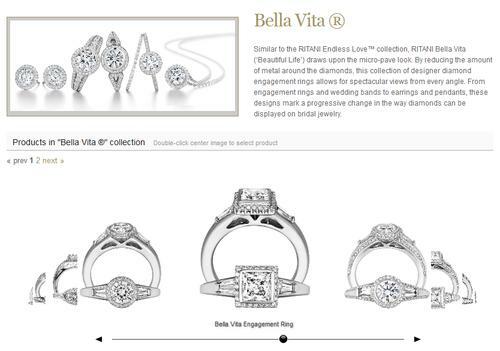 The Bella Vita collection is designed to minimize the metal around the center diamond and pave any remaining metal with micro diamonds. It is a new approach to the display of diamonds. These Diamond Engagement Wedding Rings are Fantastic. Exquisite displays of fine jewelry! It is stylish and fashionable in look. Hope to see more stylish and fashionable jewelry of your collection. Wow, That’s amazing and superb! The Diamond Engagement wedding rings are fantastic and beautiful. I like the post. Having a black diamond ring at your finger, Wow! It’s fantastic!